The streak continues for Vladimir Guerrero Jr. The top Blue Jays prospect homered in his fourth straight game, added a single and raised his Triple-A batting average to .441 in Buffalo's 6-3 to Toledo on Saturday at Coca-Cola Field. After flying to center field in the first inning against Mud Hens starter Tyler Alexander, Guerrero Jr. elevated the ball again in the third. This time, however it went out. MLB.com's No. 1 overall prospect battled to a 2-2 count against the left-hander, when he demonstrated his impressive ability to hit for power to all fields. Staying back on the pitch, he drove it to the opposite field for a solo shot and fourth dinger in as many nights. 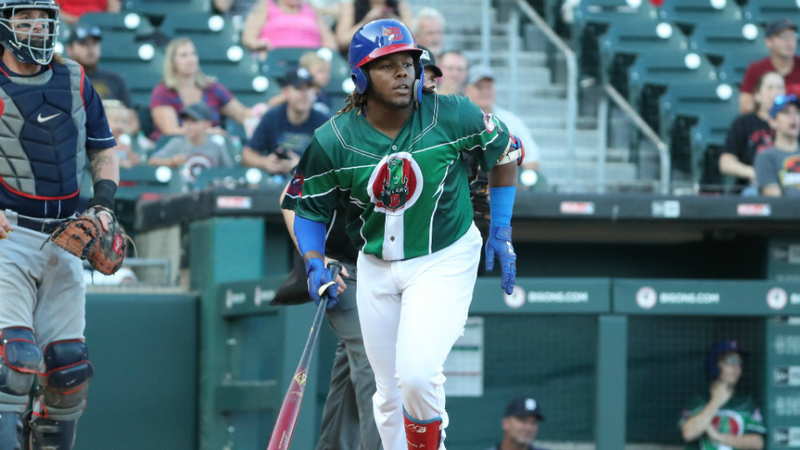 Guerrero Jr. ripped a single to left with one out in the sixth for his sixth multi-hit game since being promoted from Double-A New Hampshire at the end of July and fifth in his last six contests. The 19-year-old grounded into a double play to end the eighth, stranding two runners. His numbers -- both on the season and since arriving in Buffalo -- remain video game-like. The native of the Domincan Republic has clubbed 18 homers this year and boasts a .441/.535/.853 slash line through 11 International League games. "Everybody does a little something great, he does all of it," Bisons hitting coach Corey Hart told MiLB.com on Wednesday, the day Guerrrero Jr. began his homer streak. "He's ready to hit every time, he has great strike zone discipline ... he has a better strike zone than the umpire most of the time. "He's very, very strong and he's got a great swing. But hands down, the most important one is he's a fierce competitor." Fifth-ranked Blue Jays prospect Anthony Alford hit a sacrifice fly and later scored after lining a double in the fifth. Tigers No. 16 prospect Jacob Robson singled three times and scored twice, while sixth-ranked Christin Stewart clubbed a solo homer, his 19th. Chris Bumbaca is a contributor for MiLB.com based in New York. Follow him on Twitter @BOOMbaca. This story was not subject to the approval of the National Association of Professional Baseball Leagues or its clubs.